A tank size of 16 pints. In November 2016, some models of Frigidaire Dehumidifiers were recalled due to a possible smoke / fire hazard. 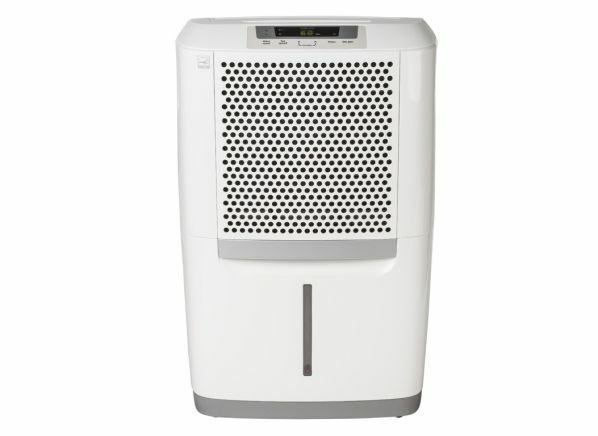 See the recall notice https://www.recallrtr.com/dehumidifier to check if your specific model is affected. The Frigidaire FAD504DWD is part of the Dehumidifier test program at Consumer Reports. In our lab tests, Dehumidifier models like the FAD504DWD are rated on multiple criteria, such as those listed below. Water removal: Water removal measures pints per day removed under 80º F and 60 percent relative humidity as well as 70º F and 70 percent relative humidity. Models closest to claimed removal scored higher. Humidistat accuracy: Humidistat accuracy is how closely humidistats came to keeping the humidity levels we set for them in our test chamber. Energy efficiency: Energy efficiency measures kWh needed to remove a pint of water from the air; the fewer the kilowatts, the higher the score. Tank size (pts.) Tank size Tank size is our measurement after the tank was full. Claimed pts/day Claimed pts/day Claimed pints/day are per manufacturers, at 80º F and 60 percent relative humidity. Price is approximate retail. Digital display Digital display Digital humidity displays are another feature on most. Frost control Frost control Most new dehumidifiers shut off their compressor if there is frost on the coils, which prevents models from wasting energy by running without dehumidifying. Auto re-start Auto re-start Automatically turns the dehumidifier back on to its prior settings after a power failure. Continuous fan Continuous fan Some models have fans that stay on even when the compressor turns off. The only time the fan stops is when the water collection bin fills up. Pump Pump Used to expel water to elevated drainage location. Alert for filter cleaning Alert for filter cleaning Unit has a filter cleaning indicator to remind you when the filter needs to be cleaned. Remote control Remote control A remote control allows for control of the dehumidifier from a distance. Timer Timer Allows you to program when a dehumidifier turns on and/or off. Most models can be set for on and off, some only for off. Drain hose included Drain hose included Some models include a drain hose to be used when the dehumidifier is set up for continuous draining. Exterior height (in.) Exterior height Our measurements include all protrusions and are rounded up to the nearest inch. (We measured only tested models, but the similar models we list should have the same dimensions.) Note that according to the manufacturers all tested models require a minimum of 12" of air space around the unit for proper performance. Exterior width (in.) Exterior width Our measurements include all protrusions and are rounded up to the nearest inch. (We measured only tested models, but the similar models we list should have the same dimensions.) Note that according to the manufacturers all tested models require a minimum of 12" of air space around the unit for proper performance. Exterior depth (in.) Exterior depth Our measurements include all protrusions and are rounded up to the nearest inch. (We measured only tested models, but the similar models we list should have the same dimensions.) Note that according to the manufacturers all tested models require a minimum of 12" of air space around the unit for proper performance.